Our company follows traditional ways of elaboration. Puig-Fitó S.L. 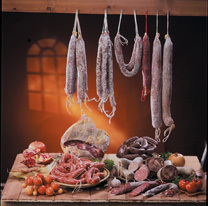 is a small family enterprise that elaborates handcrafted sausages. We always keep in mind that our staff has got its own gastronomic criterion, which enriches and improves our knowledge of the process of elaboration. This way we are able to satisfy our demanding clients, who always appreciate the quality of good handcrafted sausages. Thanks to all the experience we have been gathering throughout these last years by listening to our customers’ opinions about the product, we are eager to go forward and keep on improving to be able to offer you the best products. Our beginnings date from 1984, when we used to elaborate fresh products in our delicatessen shop. Later, we decided to start a business. So, in 1992 our enterprise Puig-Fitó S.L was born bearing in mind the aim to offer our clients the best quality in our products. Throughout all these years and up to now, we have been investing in facilities, machinery and human effort. This way we have grown in quality and variety so that we can offer good products as well as a suitable service according to our customers’ demands.